It is tempting to turn horses out into spring pastures at the first sight of green grass, especially after such a long winter. However, spring grazing should be introduced slowly and delayed until grasses reach 6 to 8” in height to optimize both the health of the horse and pasture. When horse pastures reach 6 to 8”, begin grazing for 15 minutes, increasing the grazing time each day by 15 minutes until 4 to 5 hours of consecutive grazing is reached. After that, unrestricted or continuous grazing can resume. It is also recommended to feed horses their normal hay diet before turning them out to pasture during the first several grazing events of the year (along with the time restrictions). This strategy should help avoid rapid intake of pasture grasses. 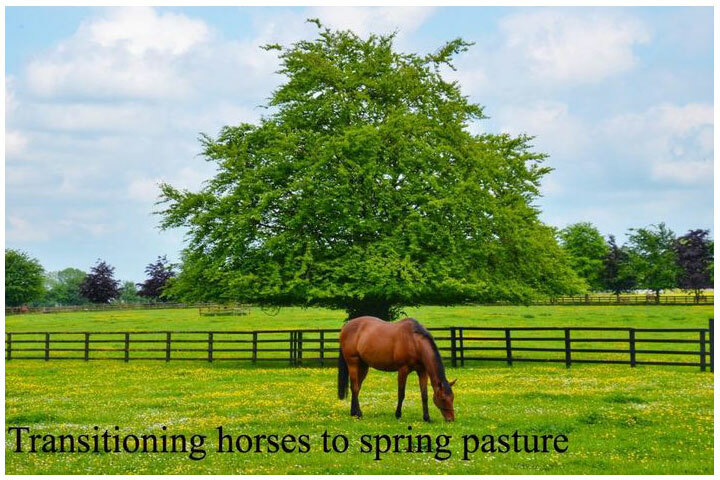 Horses grazing in the spring have difficulty with the transition from stable to more grazing. By using restore 14 days before the start of the grazing season you can support the balance of intestinal flora making it better able to cope with the change from hay to fresh pasture. Why is this recommendation so important? Change feedstuffs gradually even though hay and pasture are both forms of forages, there are significant differences. Dried hay is approximately 15% moisture compared to fresh pasture that is 85% moisture. The horse is a hind-gut, fermenting herbivore that relies extensively on the microbes present in its gastrointestinal tract to be able to process forages. The microbes are a mix of different organisms that work together to the benefit of the horse. If the feedstuffs the microbes are utilizing change suddenly, there may be too little time for the microbial populations to adjust to the change. Instead, large numbers of them die, while others flourish, setting up a situation where toxins may be absorbed by the horse, resulting in digestive dysfunction and possibly colic. A gradual change from one feedstuff to another provides enough time for the microbial populations to adjust.